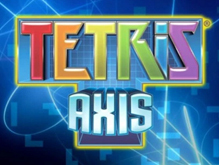 Tetris Axis (known simply as Tetris in Europe and Japan) was originally released to retail in 2011 but not available to download from the 3DS eShop until 2013. Twitter user NintenDaan confirmed on December 28th, 2014 that Tetris Axis would be delisted alongside the Game Boy version of Tetris on December 31st. Both games were delisted in North America, Europe and Japan. Continue reading for more on how and why Tetris Axis was delisted and how it fits in the digital Tetris lineage. 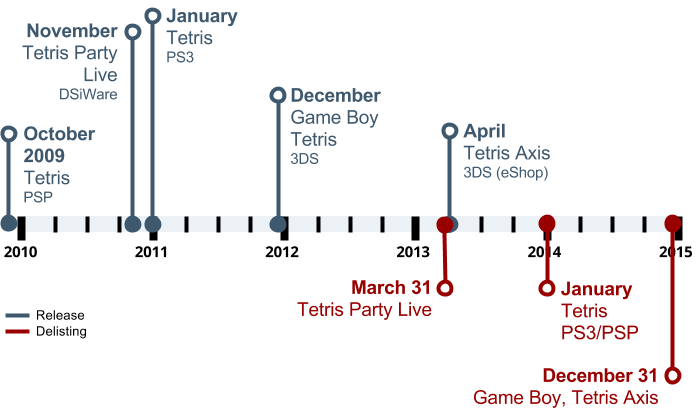 On January 16th, 2014 Ubisoft announced that they had acquired the Tetris license and would release Tetris Ultimate for all current console and handheld platforms. Although unsubstantiated, it appears this license granted Ubisoft exclusive rights to downloadable versions of Tetris. Electronic Arts previously held the license and released Tetris on PSP, PlayStation 3, Blackberry, Windows Phone, iOS and Android between 2009 and 2013. Ubisoft’s announcement resulted in a restructuring of their deal where EA would retain the rights to Tetris on mobile platforms only. Meanwhile, Nintendo’s 20-year copyright on Tetris for Game Boy expired in September of 2013. This confluence of licensing deals resulted in The Great Tetris Delisting of 2014. On January 9th, 2014 a PlayStation forum user asked if it was still possible to download Tetris for PlayStation 3. The “Buy Download” button on the game’s playstation.com page redirected to the PlayStation Store where it was not possible to complete the purchase. Over the next day other forum members confirmed that EA’s Tetris for PlayStation 3 and PlayStation Portable had been delisted, presumably due to the terms of Ubisoft’s licensing deal. Late in the year, on December 27th, Nintendo UK announced via twitter that the Game Boy version of Tetris for the 3DS would be delisted on the 31st. The following afternoon, twitter user NintenDaan posted a screenshot of a message sent to European 3DS users confirming that Tetris Axis (aka Tetris) was also being delisted on the 31st. Both games were removed in the US and Japan without advance notice to users. While the Game Boy removal makes sense based on the expired copyright, Tetris Axis’s delisting is a bit more uncertain. Having been released simply as Tetris in Europe and Japan, either EA or Ubisoft could have claimed “brand confusion” over the game, resulting in its removal. Both games join the previously delisted Tetris Party Live for Nintendo’s DSiWare platform that was removed no later than March 31, 2012. As of May 2016 very few digital Tetris titles remain available on consoles aside from Ubisoft’s Tetris Ultimate. Tetris Splash for Xbox 360 and Tetris Party for WiiWare have been available to download since they launched in 2007 and 2008 respectively. These titles were released through Tetris Online, Inc. and as they are owned by The Tetris Company there’s never been a risk of delisting while the license changed hands around them. When EA relinquished their license to Ubisoft they retained the rights to Tetris on mobile devices where they continue to support Tetris, Tetris Blitz and Tetris for iPad into 2016. In Japan, a separate, more complex license was granted to Sega allowing them to release Puyo Puyo Tetris alongside Tetris Ultimate in 2014. Apparently part of the license restricted them from releasing the game digitally on Xbox One and PlayStation 4. While physical copies were released on all platforms the game is only available to download on PlayStation 3, Vita, Wii U and 3DS. Over 20 Tetris game modes! Companies: Bandai NAMCO, Nintendo, Tetris Online Inc.